So the other day while I was in the car with Grant, he started doing something new... Sticking out his tongue at me. It was actually pretty funny!! Two nights ago while Mark, Grant and I were having dinner, I decided to give Grant an Oreo Cookie. For those that don't know, that is his favorite cookie! I started to egg him on. I would show him my tongue and he would show me his. I couldn't help but notice HOW LONG HIS TONGUE IS!!! 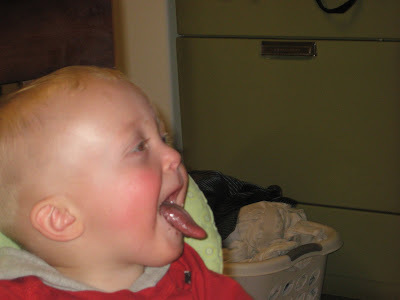 There are only three people I know that have long tongues. Myself, Rusty and my nephew Cody. I told Mark to hurry and grab the camera... Oh the memories we are able to catch by modern technology!! So now Grant has one more things like his favorite Uncle. I guess looking like him wasn't enough. It is nice to know what my kids are going to look like and act like... when I finally have them. We love Grant and we miss having your family here. Yeah, poor Grant... A spitting image of Rusty. We will be up there Friday the 6th at night... I know it's Rusty's b-day, any plans?? You want to go to the temple early saturday morning? ?